Nourish while protecting with alba Botanica Sunscreen! alba Botanica Sunscreen prides themselves on not just protecting skin, but also nourishing it with ultra-emollient sunscreens that moisturize and condition skin while keeping it hydrated with botanical extracts such as: lavender flower, aloe leaf, calendula flower, chamomile flower, coneflower, gingko biloba and ginseng extract - known for their moisturizing powers to create a luxurious super-blend of moisturizing sun protection - with a 100% vegetarian formula that doesn't contain any of the crap you don't want like artificial colours, parabens, harsh preservatives, sulfates or synthetic fragrances. 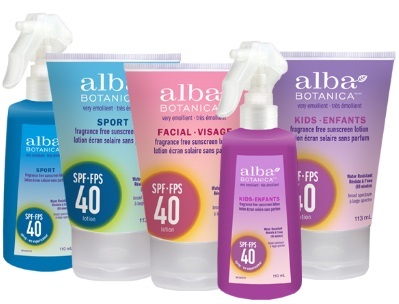 alba Botanica Facial Sunscreen Lotion - 113ml - $9.99 - with a gentle, fast-absorbing formula that won't clog pores while hydrating and nourishing and offering broad spectrum UVA/UVB protection with SPF 40.
alba Botanica Sport Sunscreen Lotion - 113ml - or Spray - 110ml - $9.99 - wtih a sweat-proof, water resistant formula that goes on quickly and stays on, protecting and conditioning with SPF 40.
alba Botanica Kids Sunscreen Lotion - 113ml - or Spray - 110ml - $9.99 - with fresh, non kid-friendly SPF 40 broad spectrum UVA/UVB protection that is water resistant and absorbs quickly offering lasting protection for active kids who can't stand still! Available now at Whole Foods, London Drugs and well.ca.